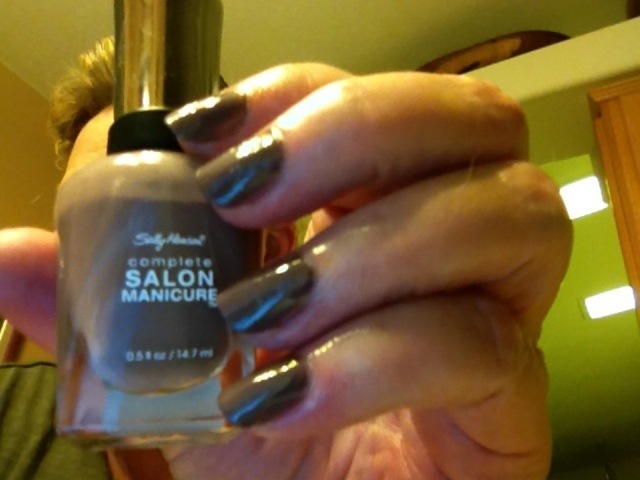 For some reason, to me anyway, it seems Sally Hansen polishes don’t get much love in the You Tube community or in the blog world. I don’t know why that is because they are a great line of polishes. The colors are great, in fact some of the colors are exact dupes for more expensive brands, the brushes are the best brushes I’ve used. The brush is wider and flatter than most. I happen to like that. I did hear one person say they didn’t like the brush, and I thought “hhnhhuh”? 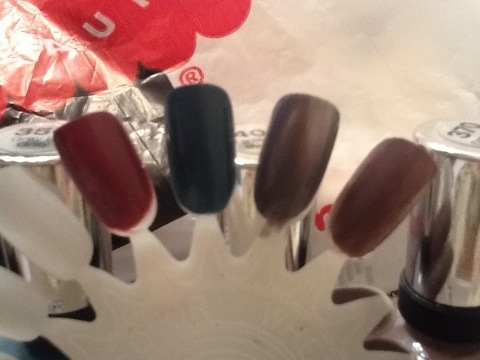 They are from left to right; Gray by Gray, Greige Gardens, Plum’s the Word and Commander in Chic. The only picture I don’t have is Plum’s the Word, because I haven’t worn that one yet. To tell the truth I forgot I had it and recently found it in my medicine cabinet. Usually I put polishes I don’t like in my medicine cabinet, so I don’t know how that one got there, because I do like it. I will probably wear it next. Here is a picture of swatches: they are from left to right; Plum’s the Word, Gray by Gray, Greige Gardens and Commander in Chic. 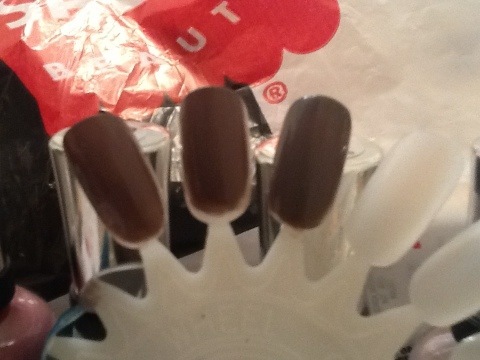 Commander in Chic is an exact dupe for Sephora by OPI Metro Chic and Essie Merino Cool. These are each swatched here, can you tell the difference? Let me know if you know of any other dupes Sally Hansen has. I think it is a great polish at an affordable price. What do you think?